Vitaliya Masliy was living in Slov`yansk city of Donetska oblast. This beautiful, graceful and at the same time strong and brave woman during military operations had to leave her home together with husband and little son. Vitaliya’s family faced a lot of troubles. All supply systems were destroyed in their flat, there was neither water no heat. ‘This war brought to my home disaster, uncertainty in future, fear for tomorrow, fear for future of my family’ – said the woman. Together with other internally displaced persons (IDPs) with special needs, Vitaliya finally found shelter in the Donbas interregional Center for professional rehabilitation of the people with special needs. The reconstruction of this Center in Kramatorsk city was done with a support of joint EU/UNDP Project “Community Based Approach to Local Development” (CBA) in cooperation with oblast, rayon, and local authority and community organizations. In the Center possibilities for life were created at all floors of the building. A new elevator was installed, hot water supply system was established, bathrooms were renovated and equipped. Irretrievable finance assistance given by the EU/ UNDP was 660,000 UAH. 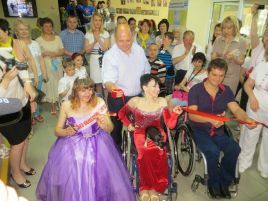 Today Vitaliya together with other wheelchair IDPs officially cut the ribbon to open her temporary shelter in Kramatorsk city. This CBA object was officially opened for accommodation of IDPs with special needs together with another repaired building in Slovyansk city. Third floor of the orthopedic building of the ‘Slov`yansk’ sanatorium was also totally renovated. The shelter in Slovyansk was re-equipped with wall hand rails, special elevators, and ramps to help people with limited mobility get around the building. Total work budget is more than 960,000 UAH, where irretrievable finance part from the EU/ UNDP CBA Project is 770,000 UAH. In total in these two reconstructed buildings in both cities their temporary shelter will find around 400 IDPs with limited physical abilities. ‘Today I became a strong and confident woman. I have a profession, which people need. I thank EU\UNDP Project CBA for support. 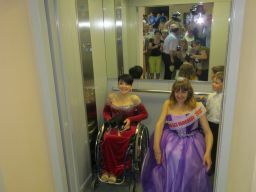 I want to have peace in the country, I want to work for the favor of all its citizens’, Vitaliya said, commenting her life in Donetsk center for professional rehabilitation of disabled people. During her professional learning, Vitaliya got social-psychological help and became confident in her capacities. Recently, this woman participated in All Ukrainian competition ‘Beauty without limitations’ – 2015 presenting Donetsk region and became winner in ‘Charm’ nomination. 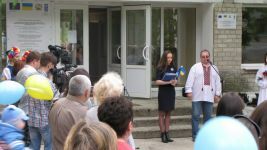 On behalf of oblast authorities the Deputy Head of Donetsk oblast state administration Mykhailo Slivka and Donetsk oblast council representative Tamara Belyankina participated in the official opening of the reconstructed Center in Kramatorsk city. ‘We have been cooperating with joint EU\UNDP CBA Project for seven years. The Project was among the first that reacted on hard current situation. It helped disabled people, those who stayed alone. With joint efforts we started to solve urgent for our region problems, providing people with shelter and warm houses.’ – said Mr. Mykhailo Slyvka, Deputy Head of Donetsk oblast state administration. Third phase of the CBA Project was launched in Donetsk region in November 13th 2014. In 8 rayons 32 micro projects will be implemented. In Dymytrov and Dobropillya cities a new component on urban development directed to improvement of the service providing to local housing sector. The EU/ UNDP CBA Project also supports repairing buildings for accommodation of IDPs in Luhansk oblast. 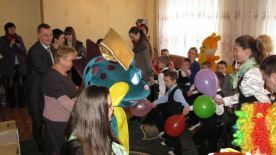 In April and May two objects in Luhansk region were officially opened – the Center for Social and Psychological rehabilitation for children in Lysychansk and the “Mriya” camp in Kreminna rayon. Thanks to well-coordinated actions of all parties - the CBA, local authority and community organizations – two buildings were fully reconstructed. “I came here about 6-7 months ago because of the armed conflict”, shares 14 years old Dima from Pervomaisk, Luhanska oblast. “Of course one cannot compare the condition of the Center before renovation and after. Now it is much better and comfortable. Other children and I like this place. I am planning to finish school and to go to study to a militia academy. I want to be a militiaman and to help people”. In a camp ‘Mriya’ (‘Dream’) in Kreminna city in Luhansk region, around 80 IDPs will find living space. There are large families, and those who decided to stay in Kreminna for living, but before this were staying in hard living conditions (18 persons lived in 1room flat). Thanks to capital repairment of two-stored building #1 all IDPs will live in normal living conditions. In this building, windows and doors were replaced, all rooms, bath-rooms, water supply, sewerage, heating systems were reconstructed. Total cost of this micro project is more than 1.5 mln UAH. UNDP together with the European Union supports several social infrastructure renovation projects with a total budget of around one million dollars in the regions that are becoming new homes for people in need. The Joint EU/UNDP Project, “Community Based Approach to Local Development,” (CBA) in partnership with local authorities helps local communities to renovate temporary lodging and social care centers for the most vulnerable, including mothers with children, the elderly and people with disabilities. After reconstruction more than 2000 internally displaced persons will find shelter there. The initiative supports 21 objects in 7 regions - Dnipropetrovsk, Kharkiv, Poltava, Zaporizzhya, Odesa, Donetsk and Luhansk - with a total budget of about a million dollars.